After airing on television for nine seasons, How I Met Your Mother made its final bow on CBS last spring. It follows the natural order of things that Twentieth Century Fox Home Entertainment is now putting together the expected complete series set for fans, but on an even more fun note, the company has decided to give away a bunch of the props from the How I Met Your Mother set. The free element of the HIMYM giveaway gives it about a thousand more cool points than Breaking Bad’s set auction. If you head over to Tumblr, you can sign up for a chance to win the grand prize: The actual bar from Maclaren’s. And yes, it’ll totally come with bar stools. In addition to signing up for the grand prize, fans can pop in between 8 and 11 p.m. ET on Monday nights (because, get it, Monday was the day How I Met Your Mother used to air) to enter flash drawings for other prizes related to the series. The giveaways will run for five weeks and include “Robin’s Vancouver Jersey,” ”Ted’s Hot Dog Costume,” “The Goliath National Bank Hard Hat,” and “The Parking Meter." Creator Craig Thomas seems stoked about giving away the props to audiences who were loyal fans of the show over the years. “We hope that you treasure and enjoy these beloved pieces of “HIMYM's” soul, or that you at least don't sell them on eBay." In addition to the fun giveaways, Twentieth Century Fox Home Entertainment is also releasing a complete series Blu-ray set. We’ve known about the complete series DVD set since April, but it is finally hitting homes on September 23. 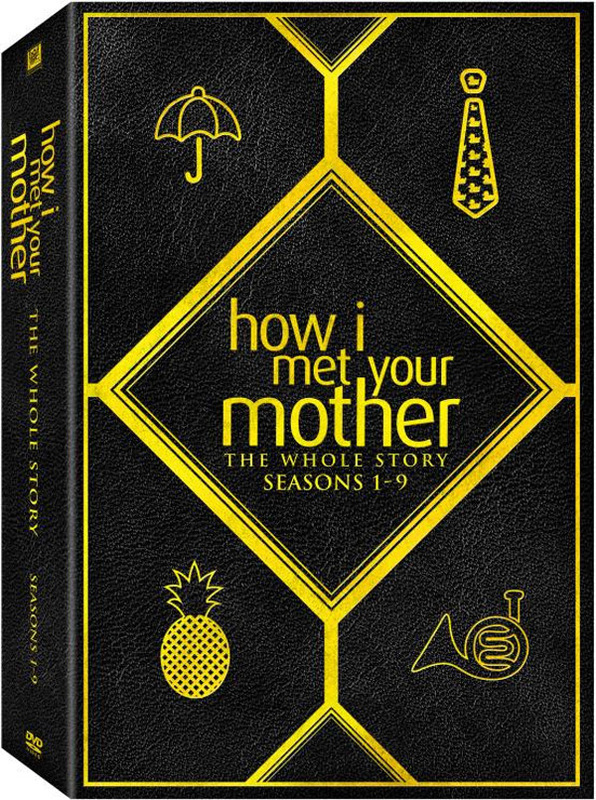 How I Met Your Mother: The Whole Story - Seasons 1-9 will come with exclusive “Bro Code Playbook” packaging and tons of extras. Here's a look at the box art. Beside each of the original season extras, The Whole Story will also feature a slew of extras exclusive to the Seasons 1-9 boxed set. You can check ‘em out, below.